Virions contain one molecule of linear double stranded DNA. Total genome length is 120000-220000 nt. Guanine + cytosine ratio 35-75 %. Virions enveloped; slightly pleomorphic; spherical; 120-200 nm in diameter. Surface projections of envelope distinct; spikes; dispersed evenly over all the surface. Nucleocapsids isometric. Nucleocapsid surrounded by the tegument that consists of globular material which is frequently asymmetrically distributed and may be variable in amount. Nucleocapsids sometimes penetrated by stain (although intact envelope impermeable to stain); 100-110 nm in diameter. Symmetry icosahedral. Nucleocapsids appear to be angular. Surface capsomer arrangement obvious. 162 capsomers per nucleocapsid (capsomeres hexagonal in cross-section with a hole running half-way down the long axis). Core consists of a fibrillar spool on which the DNA is wrapped. The ends of the fibers are anchored to the underside of the capsid shell. 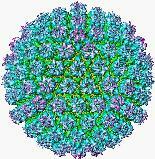 Incomplete virus particles often present; they are capsids lacking the envelope. Human Herpes Virus Electron Micrograph -- the bar represents 100 nm. From Dr Hans Ackermann, Department of Microbiology, Medical Faculty, Laval Universityj, Quebec, Canada. Herpes Simplex Virus A graphic showing the assembly of VP26 in HSV-1 inferred from structures of wild-type and recombinant capsids. From Dr. Z. Hong Zhou, Dept of Pathology at the University of Texas, Houston. Herpes Simplex 1: 26 Å map of HSV-1 A capsid reconstructed from 140 particles selected from 400-kV spot-scan electron micrographs of the A-capsids of HSV-1 embedded in vitreous ice. The top inserts show a computationally isolated hexon (blue), penton (yellow) and triplex (pink). From Dr. Z. Hong Zhou, Dept of Pathology at the University of Texas, Houston. Herpes Simplex Virus Herpes simplex virus-1 B-capsid reconstruction at 13  resolution. The map is colored coded according to the radius. From Dr. Z. Hong Zhou, Dept of Pathology at the University of Texas, Houston. Herpes simplex virus An electron microscopic image of herpes simplex virus from the Glorioso Lab at the University of Pittsburgh School of Medicine. Herpesvirus (entire particle) solved by cryo-electron microscopy and image reconstruction -- from the Institute of Molecular Virology at the University of Wisconsin. Human herpesvirus Two herpes virus particles are shown; they were prepared for transmission electron microscopy by the negative stain technique from the Wadsworth Center of the New York State Department of Health. Herpes simplex virus Herpes simplex virus, the causative agent of fever blisters. Thin section of virus particles as they leave the nucleus of an infected cell. Herpes simplex virus infection becomes latent, that is it becomes invisible after a fever blister episode, but the virus persists, in ganglia at the floor of the brain, where when conditions are right it can re-emerge. Magnification approx x40,000. Micrograph from F. A. Murphy, School of Veterinary Medicine, University of California, Davis. Herpes Simplex Virus-1 Herpes Simplex Virus-1 on a blood lymphocyte. Viral particles seen by transmission electron microscopy (TEM) at a magnification of 190,920x). This image is from Dennis Kunkel's excellent Microscopy Science and Photography Through a Microscope web site. Herpes Simplex Virus-1 A-capsid from 400kV Spot-scan Electron Cryomicroscopy -- from the Institute of Molecular Virology at the University of Wisconsin. Human herpesvirus 3 (varicella-zoster virus 1) From Stewart McNulty at Veterinary Sciences, Queen's University, Belfast. Human herpesvirus 3 (varicella-zoster virus 1) Electron micrograph -- the bar represents 100 nm. Enveloped capsids and empty envelopes are seen. Image by Dr Frank Fenner, John Curtin School of Medical Research, Australian National University, Canberra, Australia. Human herpesvirus 3 (varicella-zoster virus 1) Electron micrograph -- the bar represents 100 nm. Naked capsids are seen. Image by Dr Frank Fenner, John Curtin School of Medical Research, Australian National University, Canberra, Australia. Human Cytomegalovirus (HCMV, Human Herpesvirus 5) replication cycle cartoon Glycoprotein B (gpUL55) mediated morphogenesis of infectious HCMV particles in a replication cycle cartoon. This graphic was produced by the human cytomegalovirus study group and Dr. Marko Reschke in Marburg, Germany. Human Cytomegalovirus (HCMV, Human Herpesvirus 5) cartoon This graphic was produced by the human cytomegalovirus study group and Dr. Marko Reschke in Marburg, Germany. Cytomegalovirus cartoon From the Department of Medical Microbiology and Immunology, University of Wisconsin at Madison. Cytomegalovirus virion structure cartoon Created by students as a virology course project (Professor D.G. Harnish) in the Department of Biology, McMaster University, Canada.